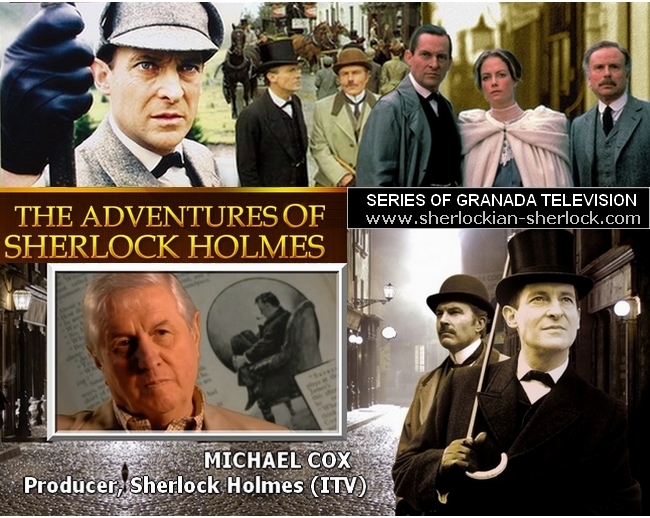 Michael Cox, the producer who worked at Granada Studios, always adored Sherlock Holmes, the greatest detective of the world. His suggestion was to make an authentic series that is faithful to the original writings of Conan Doyle. The Studio liked the idea, but they did not think that one of the greatest success story of British independent television was born. In 1988 the series had won the Swedish ’Academy of Detection’ award. Granada built up the whole Baker Street, Sherlock’s home, a square and some side streets in Manchester. They also used external locations for shooting. 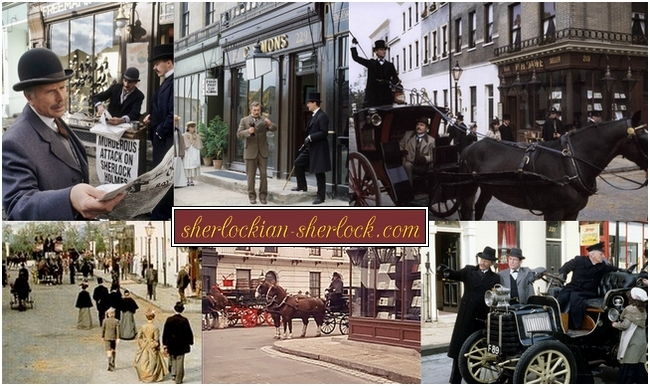 The period dresses and sets, the magnificent horses and fine hansom cabs beautifully reproduced the London of the Victorian era, where Holmes lived. In the original stories there are realtively few dialogues, Doyle worked out many things with enjoyable writing. The Granada series kept some of Watson’s narrations, but the fantastic screenwriters (John Hawkesworth, Alexander Baron, Jeremy Paul, T. R. Bowen and Alan Plater) created many funny dialogues for the exceptional actors. This largely increased the popularity of the show. British actor Jeremy Brett was chosen for the role of Sherlock. He was not too happy at first. He mostly had romantic roles, so he felt that the part of the sleuth will not suit him. Before his time Basil Rathbone portrayed Holmes so fascinatingly that for many he was the definitive Sherlock Holmes and he could not shake off the character. At last Jeremy accepted the part and determined to personify the detective with the utmost empathy. Years later he told the series was his most favourite work. He was an eccentric, just like Holmes. Because of his depression he perfectly understood Sherlock’s lethargic moments and masterly depicted them. Before the shooting started the producers gave the actors one week for rehearsal, but upon Brett’s request they changed it to two weeks. During the first week Jeremy worked on the character of Holmes, and on the second week he rehearsed with his colleagues. The first episode which was shot was The Solitary Cyclist – it functioned as a kind of warm-up for the actors. The adventure that aired first was A Scandal in Bohemia, which particularly introduced the character of Holmes. Sherlock was not new for Brett – he played dr. Watson on stage, with Charlton Heston as Holmes. He told in interviews that it helped a lot to create the figure of Sherlock. He was mesmerized and startled by the genius, who had the same mood swings as him. Jeremy liked classical music and jokes, just like Holmes. He was brilliant in scenes showing the different capers of the sleuth. The episode A Scandal in Bohemia met with a warm response in England. More and more people followed the adventures of Holmes. Thanks to Brett’s magical interpretation the Sherlock merchandise revived again. 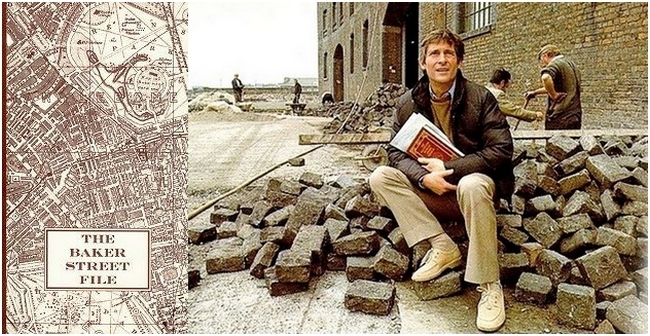 Behind the scenes: The Baker Street is being built. Brett is holding: The Illustrated Sherlock Holmes Treasury book. One clue to the success of the series is that the crew understood the eccentric personality of the detective and his addiction to work. 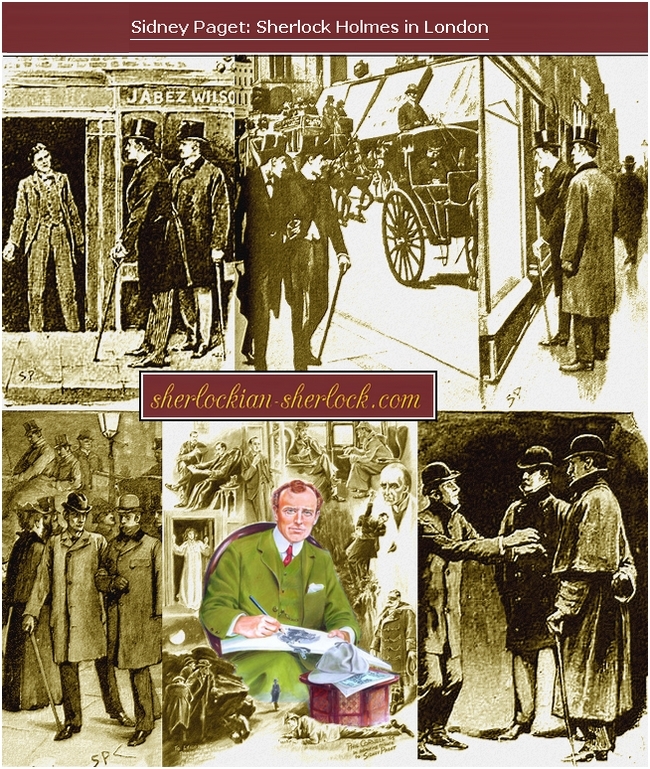 Important details and Sherlock’s extreme habits were summarized in a 77-page paper – it was called The Baker Street File. Granada made many copies of it, thus making shooting easier and faster. Jeremy took notes himself, and he used the original canon to act as faithful as possible. Brett requested to be pale, because Sherlock barely leaves his Baker Street home when he has no case, so his makeup was extremely white. It was his idea too to show Sherlock’s shining intelligence with swept-back hair on which lots of hair gel was applied. These suggestions became decisive. 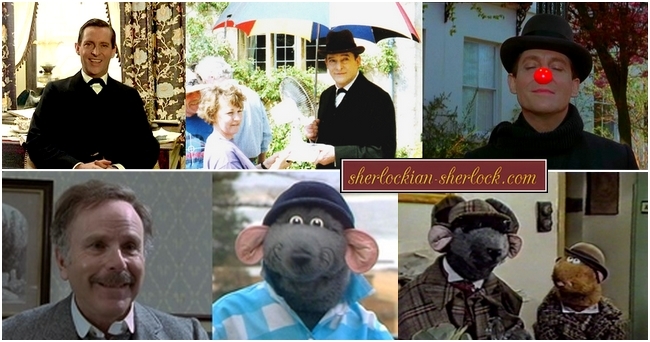 People who did not read the original novels often tried to attack Jeremy by saying that his detective is too elegant, because he wears top hat instead of the legendary deerstalker. But he knew that his portrayal was faithful. Namely Doyle’s writings were illustrated, and according to these Holmes wore deerstalker only in the countryside, in the streets of London he donned hat or top hat. Brett and the Granada crew exactly knew that the sleuth smoked different pipes in his different moods, so this characteristic had also been incorporated into the series. Jeremy learned even the hand gestures Doyle mentioned in the stories. They paid attention to the fact that the photograph of Irene Adler was always in the drawer of his desk. Brett was left-handed, while Holmes wrote with his right hand. For this reason the show used a hand double for the scenes where Sherlock has to write. Doyle’s detective has grey eyes, and though Jeremy’s eyes were green, they often seemed to be brown. He did everything for the success of the series, jumped over a sofa, run up stairs or climbed to a fireplace. He had a very energetic voice, which gave his Sherlock elemental power. Unfortunately there was not a single dubbed version that could fully bring it back. Hungarian fans are very lucky, because the Hungarian voice of Jeremy Brett is the outstanding actor, László Tahi Tóth, whose Holmes is adorable. Compared to other nations’ dubbed versions the Hungarian is singularly eminent, which is the merit of Mr. Tahi Tóth and the dubbing crew. Actor Gyula Szersén is a direct hit for the role of Watson. David Burke, who played Watson, left the series after the first season, because he could act in a play together with his wife, and this way he could spend more time with his son, who was only two years old then. Burke had mixed emotions – he was happy to be with his family and at the same time he was sad, as he loved shooting the series and him and Brett were close friends. Edward Hardwicke became the new Watson. Interestingly, David Burke himself recommended him. Viewers could see Edward first in the episode The Empty House – the truth is that his first shooting at Granada was The Abbey Grange, but that episode was shown later. He was very anxious at the beginning, but Jeremy welcomed him with love. Deep and true friendship born between the two actors, they were like Holmes and Watson in private life as well. Later, remembering the old times Edward told that Jeremy laughed a lot during shootings. Once he even got a red clown’s nose from the crew. Actor Roger Hammond, who played the mocked client, Jabez Wilson in The Red Headed League, was a good friend of Jeremy. Rosalie Williams, who portrayed Sherlock’s landlady, Mrs. Hudson, loved Brett very much, and it was mutual – so it was interesting to see them altercating. Emma Hardwicke, the daughter of the second Watson played Dora, the maid in The Three Gables. It came to Brett’s and Hardwicke’s notice that Holmes is a popular hero for kids, so they urged to leave the detective’s bad habit of taking drugs. They did not want Holmes to be a wrong role model for young people. Dame Jean Conan Doyle was Jeremy’s close friend, and upon his request she allowed the change. So Sherlock dropped his addiction in The Devil’s Foot. Brett had apprehensions in connection with the role of Holmes, and these were vindicated. Obsessed female fans appered at the shootings and often shocked him with their hot-tempered and unscrupulous behaviour. Jeremy could never shake off the character of Holmes. People always wanted him to act as Sherlock when they met him on the street. In one of his letters to Edward Hardwicke he explained he feels he behaves like the detective and the role had driven him crazy. He invented stories about Sherlock from those times which were left out from Doyle’s works. But we have to stress that he never really thought he is Sherlock Holmes, and the fabricated events helped him to embrace the character. It is a fact that portraying the great detective has always been legendarily dangerous. The reason for this is that Sherlock has an extreme personality. His odd habits, unique way of thinking and mood swings are incredibly challenging for sensitive performers. If someone was good at portraying the sleuth, later he could not escape from the role – no wonder that many actors lost their minds while struggling to play Holmes. At the beginning Jeremy unwillingly accepted the role, and later there were times when he was abhorred playing Sherlock. Still this performance made him world famous, and besides the nuisances gave him positive things as well. During the illness of his beloved wife and after her death the fact that the crew counted on him gave him strength to hold on. As in Doyle’s writing Sherlock’s health is gradually deteriorates, Jeremy’s condition got more and more worse. Unfortunately by the time of shooting the last episodes of the series his looks changed dramatically because of the medicines he took for his weakened heart. But there were other problems around the production. Costs were reduced, many prominent persons left the crew and there were too many changes in the scripts. Sadly Brett could do nothing against the alterations because of his condition. He made enormous efforts to be able to shoot The Three Gables and The Dying Detective. Between takes he sat in his wheelchair (he needed it to move more easily), and he had to wear an oxygene mask. He was in such a bad condition that the writers had to change the script of The Mazarin Stone to have Charles Gray (Mycroft Holmes) in the main role. Once Jeremy was so sick that the crew had to call for a doctor, who drew off 13 units of water from his lungs. Despite these he insisted to continue the work. „But darlings, the show must go on” – he told. For his heroic steadfastness he received many applause and positive critics, but he had never been awarded for portraying Holmes. During the making of the series and after that many books were published about the series, Sherlock Holmes and Jeremy Brett. The episodes were shown in more than 70 countries and they are accessible in DVD format. Although it has not been completed, the Granada Sherlock Holmes series is the most enchanting version of the Holmes adventures. Thank you, Granada Studios! 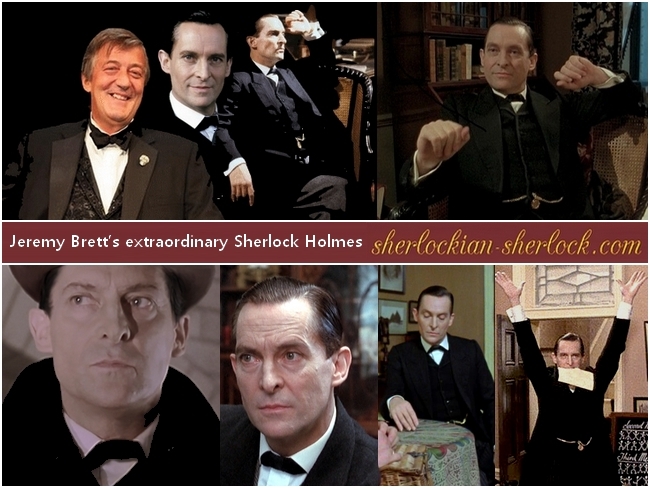 Thank you, Jeremy Brett!
" I have no doubt that few performances in the history of television drama were as perfect, passionate, exquisitely realised and definitively delivered as that of Jeremy Brett’s extraordinary Sherlock Holmes.” – told Stephen Fry, british humorist, writer, actor and filmmaker. The Sherlock Holmes series of Granada Television - itv "